In today's general aviation world, an FBO – and an airport – must do anything they can to draw airplanes full of customers to their field. I have written before on here about how some FBOs offer a free cookie, and of course we have seen those stops who lavish free steaks on bizjet crews buying lots of fuel. The airport that does this is Sunriver Airport. located along the banks of the Deschutes River, nestled against the Cascade Range in Eastern Oregon. Land there, and you'll find a rack full of about 20 bikes, free for the taking while you recreate at Sunriver. I have always been impressed with this little perk, one that is not easily forgotten once you leave this scenic part of the Pacific Northwest. I wanted to find out how the bikes came to be one of the coolest things you will find at any GA patch, so I interviewed Stephanie and Scott Hartung, the husband/wife team that has managed the Sunriver Airport for three years. Both are pilots and airplane owners (a Cessna 182), so they know how we think, and what it takes to make a transient pilot happy when they spend a few hours at Sunriver. World of Flying (WoF): The biggest surprise I found upon flying into Sunriver Airport for the first time was the free bicycles waiting to be borrowed. I have not seen this at any other airport. Tell me how the idea came about to have these bikes waiting for transcient pilots. Stephanie and Scott Hartung (SSH): The previous manager had the idea of having bikes instead of having to utilize the shuttle van since the area is so easy to bike ride in. Started with some used bikes from the Bike Barn at the resort, then the idea grew. Now have a fleet of about 20 bikes. Sunriver is very “green” oriented and much is done on bikes in the community so it was a natural fit. WoF: Where did the bikes come from, how many are there, and who maintains them? 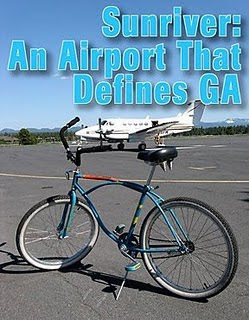 SSH: We get the bikes from the Bike Barn at the Resort and do most of the maintenance at the airport with our staff. Occasionally maintenance is more than we can handle, so we have the Bike Barn (rental and repair shop) help with maintenance. WoF: Do you know of pilots who fly in specifically because of the free loaner bikes? SSH: Yes, we have regulars that just fly in to go for a bike ride. Many are outdoor enthusiasts so they fly in, grab a bike and go for a walk along the river, go fishing, go for a bite to eat or just cruise around for the fun of it. We seem to have a regular following. WoF: What can pilots do on the loaner bikes around the Sunriver Airport? SSH: River scenery, exercise, fishing, have a meal, shop at the village, and virtually go anyplace in Sunriver. WoF: Tell me a couple of funny stories about people who have flown in there, borrowed the bikes, and then had some great experience, or complimented you on having the bikes available. WoF: Do certain pilots and airport staff have their on personal favorite loaner bike? SSH: The airport staff definitely have their favorites – we “reserve” the ones we like to work on the ramp and greet guests. The two of us have antique Schwinn coaster bikes. Heather owns and flies an old Cessna 150 which is orange and white – she calls it “Pumpkin”, so she has a bike that is orange and is called “Pumpkin bike”. Ben rides a nice old cruiser as does Nicole. Most fly-in customers enjoy the old fashioned cruiser bikes as well, but no one really has one that they use all the time. WoF: How many miles of bike paths are there for people to use when riding the loaner bikes? SSH: 35 miles. All of the bike paths are owned by the Sunriver Home Owners Association which is the “governing body” of all of the privately owner property in Sunriver. The Resort owns much of the other properties, including the golf courses, resort property, airport, marina and stables. Both entities work closely together to make Sunriver a great experience for all visitors. WoF: Would you say having the bikes has increased the popularity of Sunriver Airport? SSH: I think so, at least among locals and those that fly day-trips around Oregon. People are getting to know about the airport and bikes and we have had some folks fly up from the Bay area in California just to “play” for a day! WoF: Anything else you want my readers to know about the free loaner bikes available at your airport? SSH: We try to encourage day use only for the bikes. If they go out overnight, sometimes they end up in a rental unit garage and don’t make it back to the airport, then the next group that flies in may not have bikes to use. Plus, it then takes time to track them down and get them hauled back to the airport. No special rules apply – we do ask that people sign them out on a clipboard. Even though most people are really good about returning them so that others can have use of them, occasionally we need to make a call to get someone to return them. Overall, the system works very well and people really enjoy the bike riding.